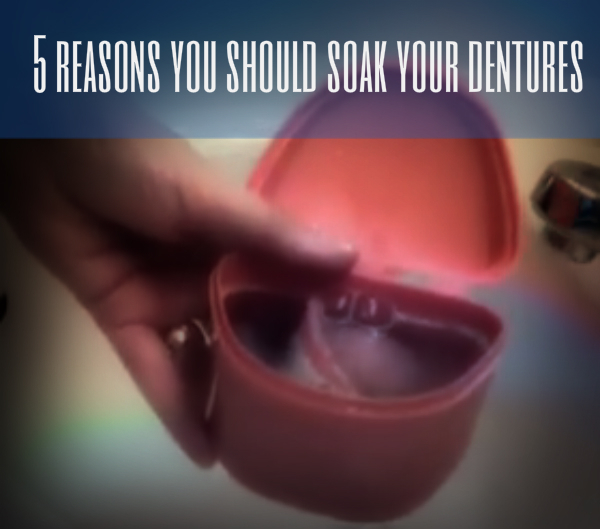 5 Reasons Why You Should Soak Your Dentures | iweardentures! Most are unaware of the consequences of prolonged denture-wear. Here are 5 reasons why you should soak your dentures. “I brush them really well”, you might say. That may be true, but it’s still not enough to get them sanitized. Just because you cannot see bacteria, doesn’t mean it isn’t there. Dentures are very porous. If you were to hold your dentures under a microscope, you might see tons and tons of teeny, tiny holes in them. Soaking with a denture cleansing tablet or solution is the only way to kill this bacteria. You have to investigate further to understand why the three minute solutions are not enough. Right on the website of one of the leading “three minute denture cleansing tablets”, it states that 99.9% of odor-causing bacteria is killed within three minutes, and in five minutes, other micro-organisms are killed. This is the typical play-on-words marketing ploy that many companies use to sell their product. The truth is, you will only be able to kill up to 99.9% of all bacteria when you soak your dentures for the reccomended 6-8 hours a day. Slow the process of bone loss. The process of bone resorption begins once the teeth are removed. The presence of tooth buds is what triggered the development of your jaw bone. As you chew with your teeth, the pressure on the roots of your tooth stimulates the jaw bone, which is what preserves it’s density. Once the tooth is remove, the bone is no longer stimulated. Thus, the process of resorption begins. To make matters worse, the constant pressure and movement of a denture causes bone loss to accelerate, which will lead to even more problems such as ill-fitting dentures, sore spots and pain, infection, etc. To preserve bone, it is advised that you avoid wearing your denture 24/7. Give your gums a break. Your gums need a break from the constant pressure and motion delivered by dentures. Prolonged denture wear can cause inflammation and sore spots which not only cause pain, but can also lead to infection. Your gums need to be massaged to promote circulation which keeps them firm and healthy. When you wear your dentures for extended periods of time, it inhibits the circulation to the area which can cause damage to your soft tissues. Failing to sanitize your denture can result in an overgrowth of bacteria, which can lead to infections such as stomatitis (yeast) and cheilitis (painful cracks at the corners of the mouth), among others. This overgrowth of bacteria is also responsible for bad breath, or, denture breath. Common symptoms of infection of the mouth include: redness and/or inflammation, granular surfaces (gums that appear spongy), bad breath, pain or discomfort. Again, the only way to cause this infection-causing bacteria is to adequately soak your dentures. When you spill something on your shirt that could cause stains, do you not soak it? Your dentures should also be soaked to prevent stains. Remember, dentures are porous. Anything porous can stain. In order to prevent the buildup of stain-causing plaque and tartar, you must soak your dentures. Stains aren’t always immediately evident. You may think your smile is still as bright as the day you got it only to glance back at pictures and think, “Wow, what happened?!”. Soaking your dentures for 6-8 hours a night can help prevent discoloration. Do I have to soak my dentures at night? It is only recommended to sleep without dentures because that is typically the longest stretch of time one has to soak them. The time of day is not the key, hereâ€”it is the length of time that matters. An hour here, two hours thereâ€”that’s not going to do it. You need a minimum of 6-8 hours to soak your dentures, no matter what time of day that might be. Choosing to go any amount of time without teeth can be difficult for some. But it is a small price to pay in order to maintain good oral health and prevent problems that could compromise your ability to wear dentures at all. I'll keep these in mind, I recently got dentures in Calgary and I don't know the most about them. I want them to last as long as possible. Good article, there are some great cleaners that actuall will kill the bacteria , if you tal to your denturists they will likely have a great solution. Eugene contact us we have a great cleanser on avail-be to denturists. with my present uppers (getting new ones along with bottom ones after wax try in next week!) the dentist (10 years ago) told me that if I found myself with no denture tabs, I could sub just a teeny drop of bleach in water. He also said that doing that once in a while would be a good way to keep them germ free, and keep the white shade as white (which ended up actually being “too white” (think, Ross on that Friends episode where he had the crazy white teeth, lol). Just wondered, if that is still recommended? I would like to propose the link exchange deal with your website iweardentures.com, for mutual benefit in getting more traffic and improve search engine’s ranking, absolutely no money involve. We will link to you from our Health & Fashion’s authority site – http://www.edanapoint.com/, from its homepage’s sidebar. In return you will agree to do the same to link back to one of our Aesthetic Clinic’s website based in Singapore, from your iweardentures.com’s homepage too (sidebar, footer, or anywhere on your homepage), with our brand name Dore Aesthetics. We will link to you from our Health & Fashion’s authority site – http://www.lugossymaria.com/, from its homepage’s sidebar. In return you will agree to do the same to link back to one of our Aesthetic Clinic’s website based in Singapore, from your iweardentures.com’s homepage too (sidebar, footer, or anywhere on your homepage), with our brand name Dore Aesthetic.